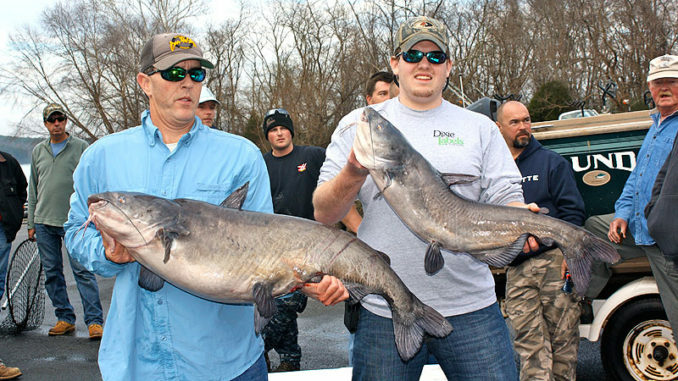 For years, Lake Norman has regularly produced nice blue catfish, especially during the winter. Anglers often compare Lake Norman’s largemouth bass to Peter Pan because they just don’t want to grow up. They can’t say the same of Norman’s blue cats. Over the years, they’ve grown to trophy sizes. In 1966, the NCWRC stocked 4,000 8-inch blue catfish fingerlings in Norman. It wasn’t until 1983 that an increasingly number of blues showed up in samples taken by N.C. Wildlife Commission biologists. 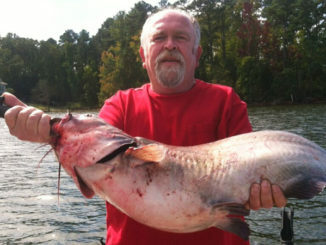 The lake now regularly yields cats from 10 to 40 pounds, highlighted by an 85-pounder, a former state record. Unlike other species that become inactive in cold weather, winter temperatures turn on blue cats. Given reasonable conditions, Neeley’s clients usually catch 10 to 15 blue cats weighing 10 to 40 pounds during a full-day trip. Neeley slow-trolls at .5 mph, running six Santee rigs out of the back of his boat. The outfits consist of sturdy baitcasting rods paired with 6500 Ambassadeur reels spooled with 20-pound line. A 50-pound leader is attached to the main line to offset the twisting and turning blues employ to try to break free. An Eagle Claw 42 hook or an Octopus hook holds cut perch or bream as bait. Neeley slow-trolls points and flats in water as deep as 40 feet, with the majority of his strikes coming in 25 to 30 feet of water. He also slow-trolls the mouths of creeks starting in 40 feet of water and gradually moving into the creeks sampling depths to 15 feet. His favorite creeks include Burton, Little and Ramsey, all on the lower end of the lake.